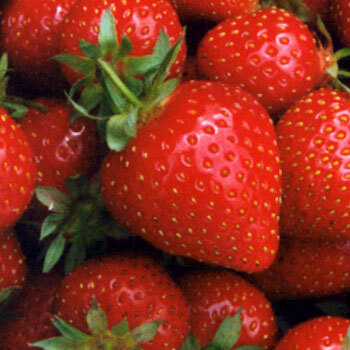 Summer—the first image that comes to mind is a strawberry. When I was very tiny—six or seven months old—my grandfather brought me in from his garden with red juice dripping from my small pudgy chin. My mother was appalled. “You didn’t feed that baby strawberries did you?” “No. No, of course not.” But of course he had. And I’ve loved strawberries ever since. As I grew a bit older, I discovered what would become my favorite picture book—The Poky Little Puppy. I enjoyed it because the puppies were such rascals. They misbehaved and disobeyed and got scolded. As a small child surrounded by adults, I too often got scolded, so those puppies were my friends. In one of their romps into the wide, wide world, the poky little puppy puts his nose down into the green grass and discovers a red, ripe strawberry. Their mother makes strawberry shortcake for dessert. Yum. Fast forward many years and I became a mom myself with two rascally daughters. I must have passed along the love of strawberries, because my older daughter loved them. But my younger daughter simply vacuumed them up, not stopping to pull off the leaves. She just gobbled them, leaves, stem, fruit and all, not stopping until every berry disappeared. If we wanted to have any for guests, we had to hide them. Now, I’m a grandmother and again, the grandchildren mostly love strawberries. The youngest one however, has even more in common with Grandma Kathy. Last summer I began sharing The Poky Little Puppy with her and for a spell it became her favorite book. At not quite two, she could recite the story by heart and turn the pages at the right times. That summer too, we prowled my back garden and there, in the green grass and between some of my flowers, wild strawberry plants were growing with those red, ripe strawberries, warm and sweet from the sun. The wild berries are tiny, no bigger than the tip of a pinkie finger. We picked them and ate them right off the stems. When they were gone, she begged for more, but we’d eaten them all. “That’s all,” her mother said. And little E began to cry. Later when days passed and more berries ripened, my daughter used naptime to collect small cups of strawberries and wild blackberries for the family. Of course the little one gobbled hers up right away. Then she carried a cup inside for her daddy, but once she’d showed him the berries, she ate his too. Nice to know this berry trait is moving along strongly through the family. Now it’s spring again and the world is greening again. Just the other day little E visited the park across from her house in New York. She bent down and quoted from the book, the part about there in the green grass was a red ripe strawberry. But no, not in a busy New York playground/park. Wishful thinking on her part. But in a few weeks, when the sun shines bright enough and the days are warm enough, there in the green grass, we’ll find more red ripe strawberries. Like the poky little puppy, maybe we’ll have strawberry shortcake for dessert. And during naptime, or when our visit is over, this Grandma will sit with her computer and mess about with words and sentences, building a new story or two. I’ll also read and read. Books and berries. The perfect way to spend a summer. Don’t you agree?